This course is continuation to FACE PAINTING. Participants will advance on the topics already learned in level 1. The skills learned in this class can be used for children’s parties, family gatherings, school events, or to make extra money as a face painter. Please provide a valid email address at the time of registration for the instructor to send you handouts prior to class. Students will be expected to print and bring handouts to each class meeting. No use of personal cameras or cells phone, or any other like devise to record the lectures provided in class. This class is for registered adults ONLY. No guests or children will be allowed into class for any reason. Please read: Please provide a valid email at the time of registration. Instructor will email handouts for student to print and bring to each class. 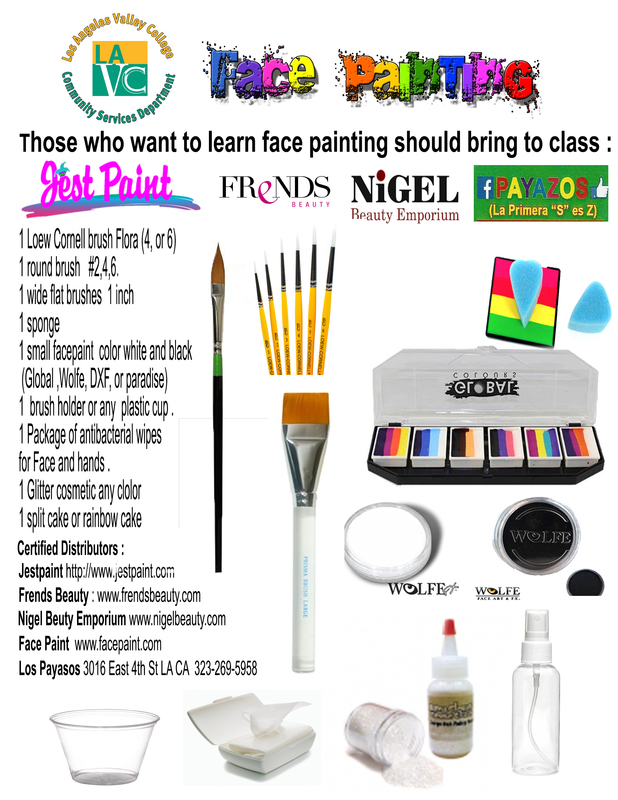 See Class description for Face Painting Materials list. Purchase and bring to first class. This class is for registered adults ONLY. No guests or children will be allowed into class for any reason.